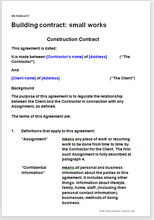 This is a basic straight forward construction contract for any small works. Simple contract for a building company employing staff to use for domestic and industrial work. It helps to protect against claims and get money in. Use for single contract or as umbrella agreement for multiple contracts. Requires that you attach specification of work. Comes with extensive notes explaining every item and leaving you simply to choose and use. This construction contract covers just those areas where you most need legal strength: limiting your liability if things go wrong, cash collection, payment for extras, no posting bad publicity on social networks. Of course, with the wide Net Lawman experience of the real World, there are a few more helpful points too. Net Lawman offers several alternative construction industry and services contracts. They include several trade-specific contracts for a sole trader doing small domestic work. See them listed at right hand side of this page. This contract is for higher value work using employees and sub-contractors for a commercial or industrial client. If you are a client wanting something formal for a contract and maybe to establish that your man is not an employee, you should buy Small works construction contract for client.